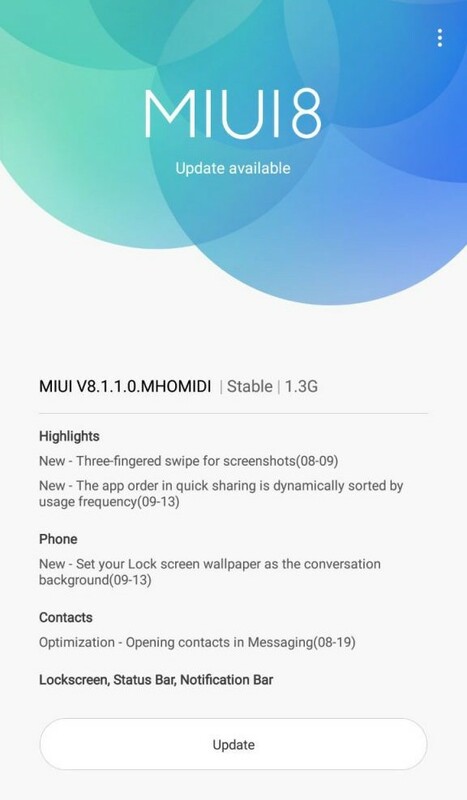 After releasing the beta version, Xiaomi has finally started releasing the MIUI 8.1.1.0 with Android 6.0 Marshmallow OTA update for its Redmi Note 3 users. The update comes with various optimizations and bug fixes. The update is about 1.3GB and is being rolled out globally. You can either wait for your device to get the update or flash the update manually. Let’s take a quick look at the Redmi Note 3’s Specs. The Xiaomi Redmi Note 3 comes with a 5.5 inch Full HD IPS LCD display, with a pixel density of ~403 PPI. The Redmi Note 3 is powered by a Qualcomm Snapdragon 650 processor clubbed with Adreno 510 GPU. The device comes 2 / 3 GB RAM and 16 / 32 GB of internal storage. The storage on the device can be further expanded using microSD card. Coming to the camera department, the Xiaomi Redmi Note 3 features a 16 MP primary camera with f/2.0 aperture, phase detection autofocus and dual LED flash. On the front, it sports a 5 MP camera with f/2.0 aperture. The Redmi Note 3 is powered by a 4050 mAh battery along with Quick Charge support. Connectivity options on the device include 4G VoLTE, Wi-Fi 802.11 a/b/g/n/ac, Bluetooth 4.1, FM Radio and microUSB v2.0.